Mr. Sunday Egede was born in Agbor Delta State on 25th day of May 1969. While on vacation when he was in School, he paid a visit to his Elder brother who owned a shop selling Provisions in Lagos and developed interest in the business and made up his mind not to seek paid employment when he is through with his education. Through dint of hard work, innovativeness and financial discipline with total dependence on God, the shop grew and he was able to establish De Prince Supermarket Gbagada as well as De prince supermarket Magodo. It was equally through these outlets that some very successful retail outlet owners were trained which include ; Ebeano Supermarket, Blenco Supermarket, Blossom Supermarket, Danny’s Supermarket, Chapter one Supermarket and host of others too numerous to mention. 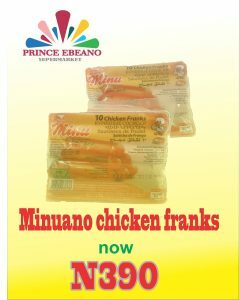 In the year 2009, he formed a partnership with his Nephew David Ojei to form Prince Ebeano & Company owners of Prince Ebeano chain of supermarket which at the moment is Nigeria’s fastest growing indigenous supermarket chain. He believes so much in God Almighty as his source and always makes himself available for God to use him to touch lives. Sunday spots business opportunities where none exists, His organizational ability and believe in orderliness and excellence is reflecting in all his outlets. He is a committed Christian and is happily married to Mrs. Joy Egede and they have 4 children. One of his Managers that have known him for over 20 years said that Sunday takes delight in seeing people succeed and is willing to offer advice and assistance where necessary. This is one of the reasons we have a host of successful retail shop owners that grew under his watch. No14 Isaac John GRA Ikeja. Plot 551 Abdulsalam Abubakar way, Gaduwa Lokogoma Junction, Abuja.